CHULA VISTA — Marine Group Boat Works LLC, a family owned boat-building and repair facility, has been awarded two separate contracts to fully refurbish San Francisco Bay commuter ferries: the 180-foot MS San Francisco, owned by the Golden Gate Bridge Highway and Transportation District; and the 97-foot Bay Breeze, owned by the Water Emergency Transportation Authority (WETA). The MS San Francisco contract, valued in excess of $18 million, was awarded in June; and the Bay Breeze contract, valued at more than $4 million, was awarded in March. Both vessels are currently out of the water and docked for refurbishment at Marine Group’s facility on South San Diego Bay. “San Diego — specifically the South Bay — has become a mecca for working waterfront opportunities for working families and vendors alike,” said Todd Roberts, vice president of Marine Group Boat Works. “Having infrastructure, capacity and facilities are critical for keeping a balanced and healthy environment. Although 100 percent of the work will be performed locally at Marine Group’s 15-acre waterfront facility, the economic impact is nationwide, according to a report titled “Economic Importance of the U.S. Shipbuilding and Repairing Industry,” released by the U.S. Maritime Administration. The report evaluated 2011 data from the private shipbuilding and repair sector. According to the study, each job in the industry leads to another 2.7 jobs nationally — and every dollar spent on goods and services leads to another $2.66 in the wider economy. More than $15 million will be spent in materials and subcontractors over the life of the two contracts. While a majority of the specialty subcontractors, original equipment manufacturers, naval architects and engineering firms are or will be sourced locally, several will come from as far as Germany and Australia. Well in excess of $250,000 is expected to be spent on flights, hotels and car rentals to accommodate ferry contract representatives, crew, naval architects, manufacturer representatives and other technicians involved in the refurbishment. More than 50 jobs were created in-house — up by about 45 percent from 2012. “These figures are only the numbers we’re able to track,” Roberts said. “We’re not counting the indirect costs that incur throughout the supply chain or simply how many of the business trips are extended to include leisure time in San Diego and the tourism from that. Bay Breeze was built in Washington State and delivered to California in 1994 to serve San Francisco Bay Area commuters. It operated between Alameda’s Harbor Bay and San Francisco before WETA awarded the refurbishment contract earlier this year. Shortly after that, the ferry was towed to Marine Group’s facility, where it was hauled out of the water and structural modifications began. Upon completion of the project, Bay Breeze will have a newly installed conventional propeller system, a brand-new interior, systems upgrades and a new paint scheme to match the current look of the fleet. The contract is approximately 80 percent complete, Roberts said. MS San Francisco was built in San Diego and delivered in 1977 to the Bay Area for service. 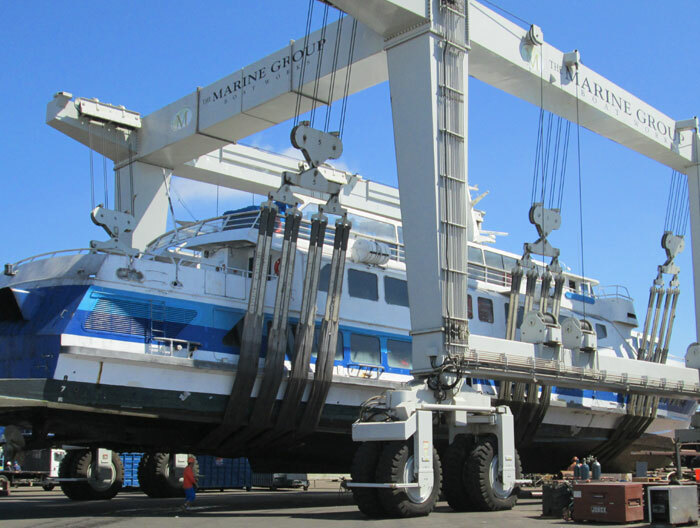 After 36 years of transporting commuting passengers to and from Larkspur, the ferry returned to San Diego and was hauled out via Marine Group’s 665-ton mobile lift in Chula Vista. Upon completion of the contract, MS San Francisco will nearly have all new components; machinery, electrical and auxiliary systems replaced and/or upgraded; a brand-new interior; and new paint. The estimated project completion time is 14 months. Marine Group Boat Works, a full-service boat builder and repair company, has two facilities on San Diego Bay and one in Los Cabos, Mexico. Marine Group’s headquarters in Chula Vista consists of 15 acres of land and water; 2,100 feet of docks; a 665-ton Travelift; fabrication and welding environments for both steel and aluminum, and production equipment to accommodate vessels up to 220 feet. Its sister yards in National City and San Jose del Cabo encompass more than 300,000 square feet of land and water, and feature 300- and 150-ton Travelifts, respectively. Between the three facilities, Marine Group employs more than 150 ABS-certified welders, shipfitters, pipefitters, mechanics, painters and equipment operators. For more information, visit marinegroupboatworks.com.